This lesson can be used as a pre-lesson for the Fiction vs. Nonfiction lesson plan. 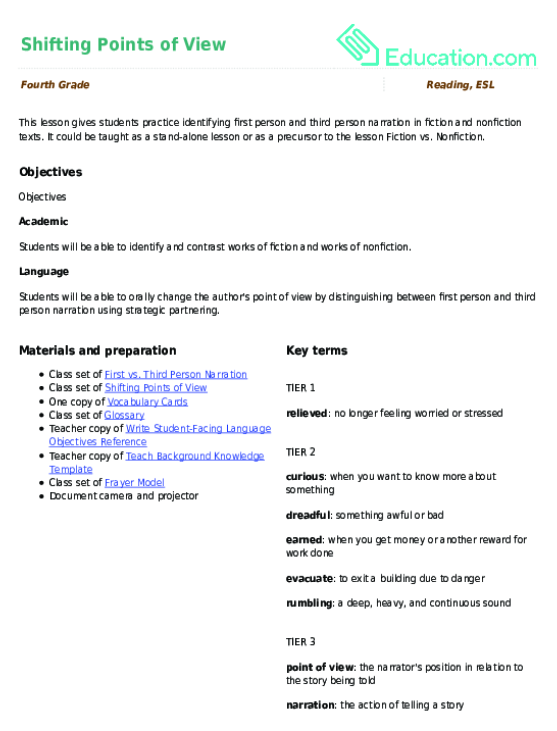 Students will be able to identify and contrast works of fiction and works of nonfiction. 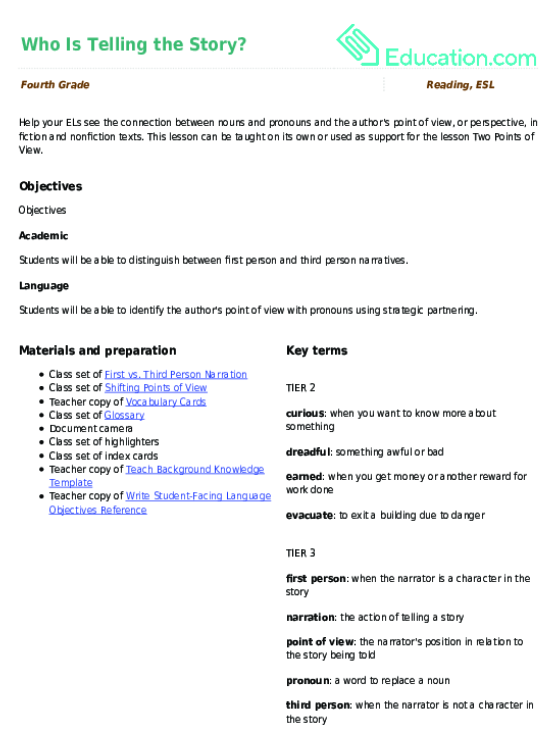 Students will be able to orally change the author's point of view by distinguishing between first person and third person narration using strategic partnering. Write the following two sentences on the board and read them to students: "Her cat was missing and she was so sad," and "My cat was missing and I was so sad." Ask students to think about the similarities and differences between the two sentences. Have students discuss these with a partner before sharing out. Record students' responses. Inform students that the main difference between the sentences is the writer's point of view or from whom/where the story is told. The pronouns, or words that replace nouns, are different in each sentence. Briefly go over pronoun examples, and have students circle the pronouns in the two sentences on the board. 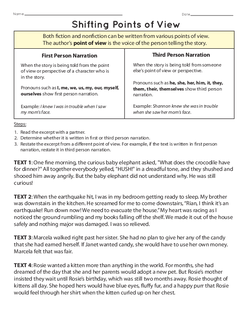 Explain that today students will practice identifying first and third person narration, or another way to state author's point of view by considering pronouns related to each point of view. 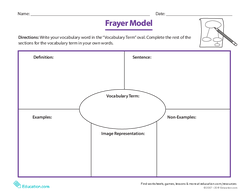 Tell students that they will learn some new vocabulary words related to the texts in the lesson. Display the Vocabulary Cards for the eight key words in the lesson on the document camera. Read aloud the student-friendly definitions and show students the images. Distribute a copy of the glossary to each student. Model with a volunteer student how to take turns reading a word and its definition, before coming up with a sentence with the word. Pair up students that work well together and have them repeat the activity modeled. 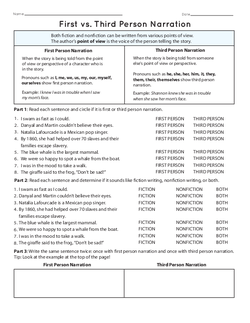 Distribute copies of the First vs. Third Person Narration worksheet to students and display a copy on the document camera. Read the teaching box out loud, emphasizing the different pronouns related to each type of narration. Note: If your students are unfamiliar with the definition of pronouns, review it with them by providing a definition and sample sentences focused on pronouns. Model how to complete the first problem in Part 1 of the worksheet before asking students to complete the rest independently. Repeat this process for Part 2. Assign students into strategic partnerships and instruct them to complete Part 3 orally with their partner before writing down the two sentences from first and third person points of view. Tell students that they will practice changing the narrator's point of view in a few sample text excerpts. 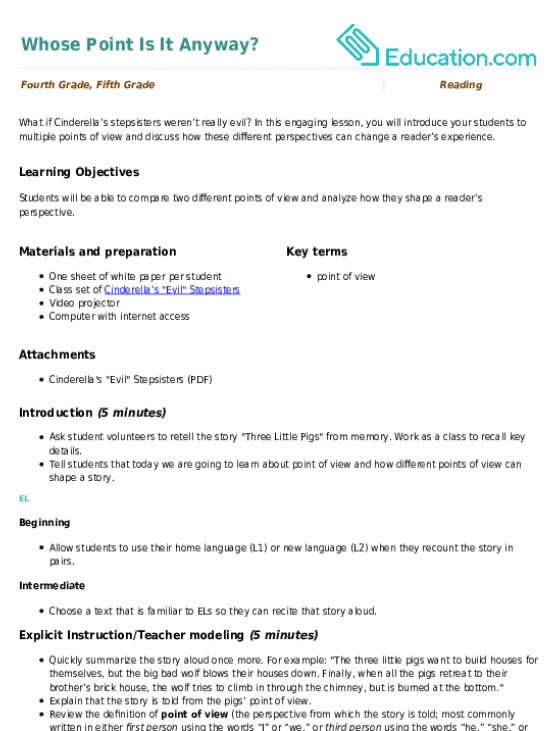 Emphasize that point of view matters both in fiction and nonfiction. Explain that in nonfiction, an autobiography (the story of someone's life written by that person) would mostly be written in first person narration while a biography (the story of someone's life written by another person) would be in third person narration. 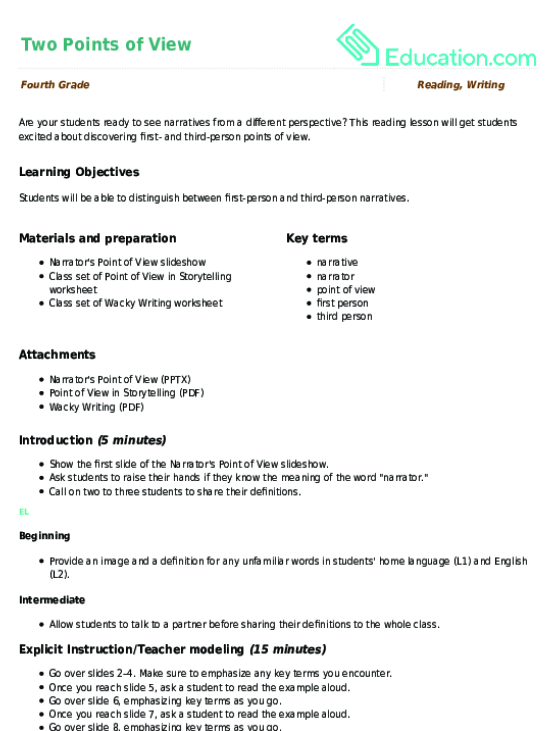 Hand out the Shifting Points of View worksheet to students and display a copy on the document camera. Read the teaching box aloud. Point out the pronouns in the first sample text and demonstrate how to change the voice or point of view of the text orally. Have students use the same effective partner from the previous section to complete this oral activity. Circulate to assist students as needed. 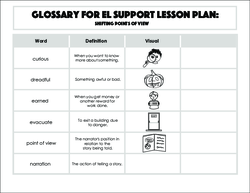 Allow beginning ELs to use bilingual resources (glossary, thesaurus, or online dictionary) to define unfamiliar words throughout the lesson. 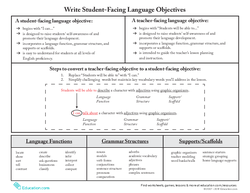 Strategically pair beginning ELs with more advanced ELs or students who speak the same home language (L1). 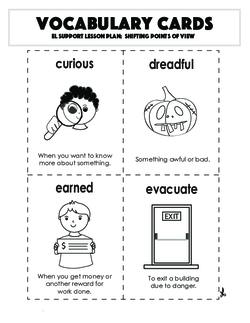 Choose advanced ELs to share their sentences first in group discussions. 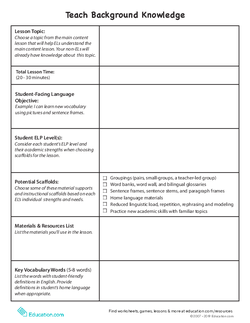 Ask advanced ELs to add on, rephrase, or clarify what their peers say in class discussion. Have students read the two sentences they wrote from the sentence level focus, in random order. Ask the other students to point to themselves if the sentence is a first person narration and to another classmate if it is a third person narration. Gauge students' understanding based on their ability to correctly identify each point of view in the sentences. Ask students to discuss the following question: Why does knowing the author's point of view matter to us? Provide sentence starters to aid students: "Knowing the author's point of view helps us..." and "By noticing who is telling the story, we can..."